A premier resort destination, Bayfield is the gateway to many fun water activities that your entire family will love. Kayaking in the south shore of Lake Superior gives you the chance to go on an island-hopping adventure. 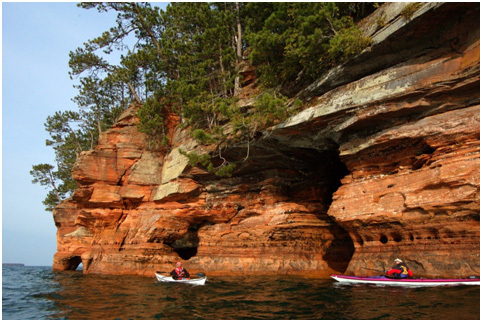 Just off of Bayfield’s shores is the Apostle Islands National Lakeshore, which boasts 21 islands, all of which you can paddle to. Here you’ll find stunning sights ranging from sheer cliffs to dramatically striated sea caves to historic lighthouses. And because of the water’s remarkable clarity (up to 100 feet in some places! ), you may even see some underwater sights without having to get off your kayak. The calm waters of Lake Superior make it ideal for stand-up paddle boarding. Aside from taking in the wonderful views around you, you can also duck into the little coves and sea caves carved into the Apostle Islands. There are many nooks and crannies here that only a paddle boarder can explore. In Bayfield and the Apostle Islands, there’s always something wonderful to see – and some of the best sights are underwater. The crystal-clear water makes the area a diver’s dream come true. Explore rock formations rising from the lakebed or marvel at the pensive beauty of shipwrecks. You can also explore submerged dock cribs from the 1890s near the sandstone quarry. Bring a sweater and your camera when you embark on a sailing adventure in Bayfield. The surrounding area is very picturesque, thanks to the stunning cliffs, iconic lighthouses, and deep forests. Ever wondered what it feels like to man a water vessel? Many boat tour operators actually allow guests to assist the captain with navigating the ship. There’s also the option of renting smaller boats for private tours or events. Fishing enthusiasts will be pleased to know that there are numerous fishing charters in the Bayfield area. Some of the prize catch here include trout, whitefish, walleye, pike, smallmouth bass, and salmon. You also have the option of booking either a half-day or full-day charter. Just be sure to have a valid Wisconsin fishing license, and the appropriate stamps for Great Lakes trout and salmon. As you can see, the Bayfield area is a paradise for those who love water and water-based activities. Whether you’re planning on staying here for the weekend, the season, or forever, there will always be something here for you to enjoy. Want to learn more about this premier coastal community? Call Windseeker Realty LLC at (715)779-5000 or e-mail Agent(at)WindseekerRealty(dotted)com.